They are loaded with luxurious add-ons and bespoke services, brimming with champagne and caviar. But most of all, they have a great big whopping price tag to match. Just joined the nouveau riche with an unexpected lottery win? Perhaps you've hit it big on some forgotten sports bet? Or were there a few more dimes in that piggy bank than you expected? Maybe you're just curious how the rich and famous fly when money is no object and luxury has no limits. Whatever your reason for being here, Hopper's selection of 10 flights and their matching figures will do well to inspire a gasp. They are loaded with luxurious add-ons and bespoke services, brimming with champagne and caviar. But most of all, they have a great big whopping price tag to match. For a whopping $14,000 or more, passengers from New York's JFK airport can now experience Singapore Airlines' all-new first class suites. Forget those old reclining booth chairs, because these babies are the real deal, with sliding cabin doors that enclose travelers in their own room, complete with a standalone bed, dining table and 23-inch LCD entertainment system. Naturally, there's also a fully-fledged gourmet food service and a wine list to die for. For first class suite passengers on this Qantas connection from LAX to Melbourne, the luxury begins in the airport, where the airline's all new International Business Lounge offers up plush leather seats and an open fireplace. 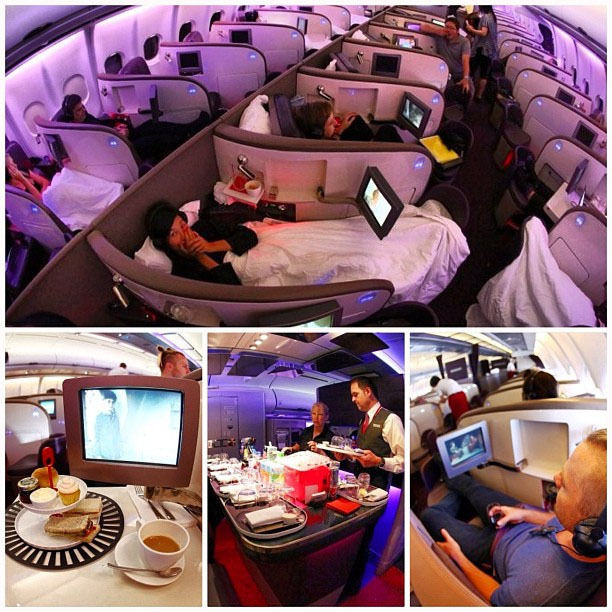 Once on board, the fully reclining six-foot bed and its luxurious sheepskin mattress, A380's massive touch-screen entertainment systems, endless array of bubbling champagnes and Australian reds and whites and top-chef Neil Perry's selection of à la carte dishes take center stage. For just $16,000 return passengers can now get their hands on one of Japan Airlines' all-new first class suites; a partitioned space of leather upholstery, reclining mattress beds, 23-inch flat screen TVs and concealed storage spaces, all served with an à la carte offering of Western dishes and Japanese sushi and sashimi plates. Drinks-wise, there's also a wide selection of reds, whites and sparkling champagnes to be had, along with the finest array of sake rice wines, complete with big name brands like Kamoshibito Kuheiji, Iso Jima and the famous Moriizou. So, what does $17,000+ get you in the skies these days? Well, Germany's flagship carrier thinks their on-ground personal assistants, standalone seat and bed setup, in-flight air humidifiers, bespoke toiletry kits, Markus Del Monego-selected wine list and Michelin-starred culinary offering hits the mark, and with their five-star Skytrax rating and a place in 2014's top 10 worldwide carrier table, they may just be right. You can expect to pay for the luxury of finding out, though. The dimly lit, swish and stylish matte black booths of Virgin Atlantic's so-called upper class really do live up to their name. Complete with fully-reclining seat beds and private entertainment screens, they're a particular favorite among traveling businesspeople, who can make use of the built-in swivel technology to conduct in-flight meetings. Perhaps the most expensive route on the roster with Virgin Atlantic is this one from JFK to Hong Kong, which comes in at upwards of a whopping $21,000 round-trip (but includes a chauffeur -- nice). We found this heart-stopping $22,000 ticket for travel between the two metropolises in late July, including a stopover in the SWISS hub of Zurich International. Touted by the airline as "your home above the clouds," the first class offering from the flagship carrier is nothing short of regal, with a culinary selection fielded by Michelin-starred chef Dominique Gauthier, bespoke toiletry packs from leading international brands and full-length mattress beds. No wonder they keep winning awards! 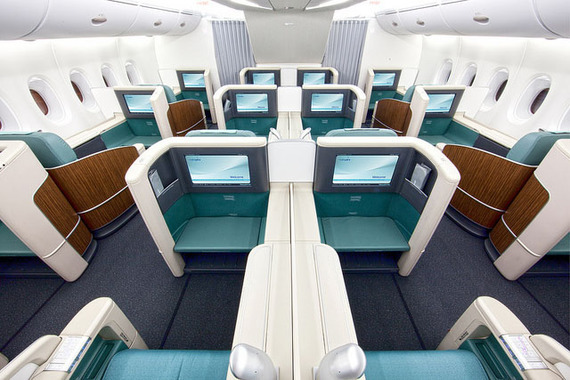 Aboard Cathay Pacific's Boeing 777-300ER on the 14-hour connection from Hong Kong to New York's JFK, jet set passengers are treated to an award-winning first class service that makes use of a unique 1-1-1 orientation in three rows. This roomy cabin layout means guests are free to enjoy their wide berth beds and flat screen TVs in peace, as the cabin crew serve the carrier's trademark array of Hong Kong dishes, a wide selection of international wines and caviar breakfasts. All that for just $26,572! If Korean Air's trademark First Class Kosmo Sleeper Seats sound high-tech and fancy, that's because they are! Boasting 100% reclining abilities controlled by one-touch pads and partitioning that encloses passengers in a timber-panelled enclave of real luxury, they are among the most coveted in the skies. What's more the Mercury Award-winning in-flight food service comes complete with oriental dishes to die for, not to mention a wealth of well-known worldly wine labels. Round-trip tickets on the route from New York's JFK to Beijing will cost anything upwards of $27,000. Travelers making their way to the oil-rich capital of the UAE would do well to prepare themselves for the famed luxury of the city's new palatial hotels. And what better way than with a first-class ticket into town with the nation's flagship carrier Etihad Airways, who offer up their partitioned suites complete with 23-inch cinema screens, private mini bars, Middle Eastern infused al a carte menus and upholstered leather furnishings to boot. The catch? It may just cost you $29,000 round-trip! It's perhaps no wonder that this 16-hour direct connection from LAX to Dubai hits the highest rungs of this list, what with all the fashionistas, A-listers, VIP businessmen and Hollywood locals that no doubt make the trip regularly. That said, there's no question that Emirates' first class offering is good, in fact it's nothing short of legendary -- with most A380s, A340-500s and 777s now coming complete with fully partitioned private suites, individual mini bars, flat laying mattress beds, vanity tables and even on-flight spa facilities! This article originally appeared on Hopper.com, the app that tells you when is the best time to fly and buy.